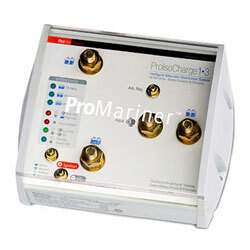 ProIsoCharge Digitally Controlled Isolators - The ProMar Digital Performance Charging Line is significantly smarter with innovative alternator output distribution while protecting the health of the main engine start battery and charging other independent battery banks. The most innovative "zero volt loss" engine alternator charging isolator available. With ProIsoCharge you save space and time by eliminating traditional low efficiency diode isolators and ancillary voltage sensitive relays or solenoids to isolate and charge multiple battery banks. ProMar Digital Performance charging products are designed to be used world wide, while eliminating typical alternator voltage loss associated with traditional diode based battery isolators. Properly charge and condition your vessels batteries and banks while underway. Installed with the ProMariner ProNautic P Series charger you can enjoy the full benefit of shore power and on the water charging. Designed to give you more time on the water enjoying what you like most. All Digital design delivering active battery status and automatic engine battery health priority while digitally distributing the full output of your engine’s alternator(s). ProIsoCharge will annunciate system on and active status for system normal operation to include alternator on and online battery banks that are charging. Priority management if the engine battery is healthy it can be taken off line in addition to other banks for power boost to a bank under load that requires priority recovery. Fault conditions to include high and low alternator input and over voltage protection and annunciation of high voltage conditions that may be present on any one of the battery banks connected (that are also connected to other charging sources gen set combi etc). Active Distributed On Demand™ battery bank management will only activate with ignition power on. Advance regulator remote sense output provided for precision alternator algorithm control. Modular design for easy install. Includes all terminal stud insulator boots and protective snap on unit cover. Fuse all inputs and outputs within 7 inches to protect DC wiring. Unit is self protected with gold plated hardware for hassle free terminations. Underway charging and battery bank real time status.